Dorset's largest town Pool has an untouched natural large harbour over 100 miles round that makes Poole a fine yachting centre , also many boat-building yards. There are numerous18th and early 19th century houses including delightful old inns. 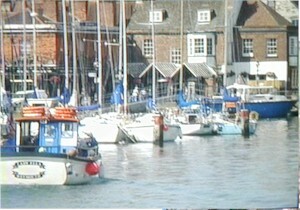 Poole pottery on the Quayside is open to the public showing visitors how the pottery is made. Pool Park has many features a boating lake, miniature railway, zoo and plenty more.